If you still don’t know what to buy in Columbia, you should know that it is the perfect country to buy original things of a high quality at a good price. We don’t just win with the exchange rate, given that 1 euro is equal to 3.32 pesos, but also with the variety of products. 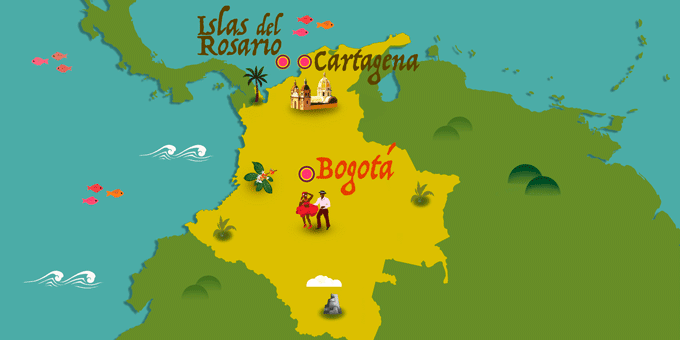 In Columbia you can buy many things, from handicrafts to clothing. In fact, you will find international brands of clothing in many places. But if you want to buy typical Columbian products, pay attention to the following list. Columbian emeralds are considered unique in the world thanks to their extraordinary quality. The purity, size, colour and hardness are highly valued at an international level. Boyacá is one of the main municipalities where Columbian emeralds are produced. In addition to emeralds, you also have coffee, carranga (folk music) and butterflies. In Chivor, municipality of Boyacá, thousands of tourists travel there often to discover the quality of its precious stones. On the other hand, in Bogotá, its proximity to the mining areas, as well as the development of the infrastructure for the cutting and setting of emeralds, turn it into the main seller. If you are going to buy emeralds in Columbia, we recommend you go to accredited jewellers and request a certificate of authenticity. In the same way as the precious stones, jewellery are another star buy in Columbia. The quality of the gold work in the country is well proven and is respected throughout the world. Many tourists buy pre-Columbian replicas of extraordinary quality and crafting. But it isn’t just the antique jewellery which is of value, pieces from current designers are becoming more important at an international level. In the same way as with the emeralds, if you are going to buy jewellery with precious stones, we recommend you request a certificate of authenticity. Columbian leather items have gained a lot of prestige. The manufacture of leather from Columbia has conquered the international market thanks to its high quality. Proof of this is the increasing exportation of this type of products and their success at international fairs. With this material you can find bags, jackets, purses, wallets, belts, accessories and, of course, footwear. What better present than a handmade bag or a wallet made of authentic leather! You won’t just look good, but you will be contributing to a small craftsman. One of the best known and most valued typical Columbian products at a world level is coffee. Although the bush which produces it comes from the African continent, Columbia has been the biggest world producer since the 1920’s. The success of Columbian coffee is due to its high quality, the difference from other coffees is that it is 100% Arabic. As well as the influence of the Arabic variety for its aroma and flavour, in Columbia coffee continues to be collected by hand. This process notably improves the quality of the grain, and hence its fame and value. Within the wide range of Columbian souvenirs that we can find, handicrafts are the jewel in the crown. Everyone who travels to this country will not hesitate to take home, or as a gift, one of the following objects: a miniature ‘chiva’ (traditional wooden bus), a San Jacinto hammock, and one or more of the traditional Voltiado and Aguadeño sombreros (hats). As well as these three-star items, Carthage embroideries are also highly valued, as well as objects made from pumpkins. But it doesn’t all end there, the traditional baskets, the Sierra Nevada rucksacks or the Kuna Indians’ molas (art) are products which are also in very high demand. The latter are highly valued for being a type of ancestral textile art which astonishes people with its bright colours and painstakingness of its manufacture. In this section, you have to bear in mind that many Columbian companies manufacture clothing for international brands. If you want to buy quality clothing at a good price, the best thing to do is to visit one of the best-known shopping centres of Bogotá. Amongst them, the Andino shopping centre is one of the most famous for being one of the largest in South America. Another place to buy quality branded clothing is the Hacienda Santa Bárbara shopping centre. If you like shopping, this shopping centre is your paradise, it’s built within a hacienda (an old colonial house). Here there are 7 floors full of shops, restaurants, cafés and everything you need to have a good day's shopping. But if you want to visit the paradise of shopping which is good, pretty and cheap, Medellín is your city. Medellín is considered the world centre of fashion, and not in vain, since producers and manufacturers from all over the world come to meet here. Now you know what to buy in Columbia, and as you can see, you have a wide range of possibilities to choose from.